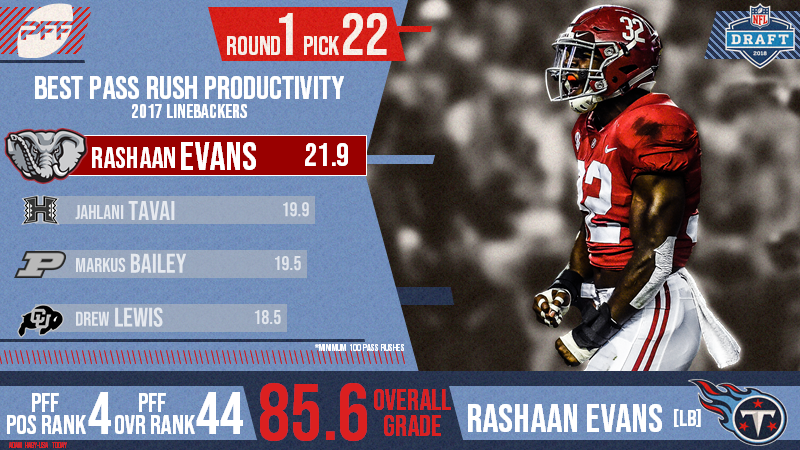 With the 22nd selection of the 2018 NFL Draft, the Tennessee Titans have selected Rashaan Evans. The former Alabama linebacker was selected 22nd overall after finishing the 2017 season with an 85.6 overall grade. The Titans pick him after a trade with the Baltimore Ravens. Tennessee received Baltimore’s Round 1 (22) and a sixth-round pick in exchange for the Titans Round 1 (25) and a fourth-round pick. The Titans traded up to No. 22 overall, after Baltimore sent their Round 1 (16) and Round 5 (154) in exchange for Buffalo’s Round 1 (22) and Round 3 (65). Evans ranked 43rd among draft-eligible off-ball linebackers in yards per cover snap in 2017 (0.63). He ranked 83rd among draft-eligible off-ball linebackers in tackling efficiency in 2017 (8.4).